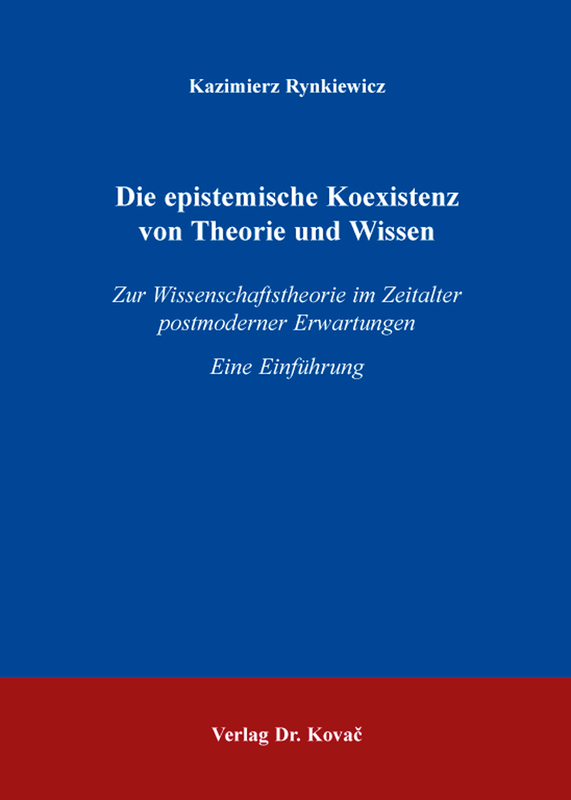 Die epistemische Koexistenz von Theorie und Wissen. Forschungsarbeit (english) von Kazimierz Rynkiewicz, Verlag Dr. Kovač 2016, 328 S.
To explain the world as a whole has always been the desire of people. In their quest for this knowledge the sciences relate to the world. What makes this interesting is: every science can have the world as its object, but not itself. In other words: science cannot reproduce the way how it relates to the world. This is the starting point of the book. There is an attempt to find answers to questions about the “how of knowledge”. How is scientific knowledge being acquired? How can the postmodern man today systematize the immense knowledge, establish new scientific questions as meaningful or discover their lack of meaning? What is the role of factors like paradigms, principles, reason or truth? The central idea of the book is based on the one hand on the need of the author to deepen the epistemological analysis of the concept of knowledge through scientific theoretical analysis. The epistemological analysis was presented in his earlier book “The handling of knowledge today. Epistemology in the 21st century”. On the other hand findings were crucial that were obtained in the investigation of this problem in recent years. The main thesis, which arises from the book, can be summarized as follows: “The knowledge must today – more than ever – be systematized with the help of theories”. And this has to be achieved by a theory of science. It turns out that theory can be regarded as a linguistically formulated system. Science is, however, a systematically ordered structure of theories. This way a base is created, on which the philosophy of science can be thought as a theory of scientific theories. To achieve its purpose in the postmodern age science necessarily requires specific terms, methods, paradigms, models etc. These entities seem plausible in a “network of paradigms”.